These gorgeous creatures have recently gone on to their new homes with high hopes of joining the ever growing list of Rideaufield bred Champion Arabians and Half Arabians. Although it always makes us sad to say goodbye to our horses, we take comfort in the fact that they will be getting the individual attention and further development with their new "parents". This beautiful black filly was foaled here on June 3, 2010 - She is a full sibling to the highly successful Peppermint Paddy RF+++/ as well as to Ice Capades RF (2006) and the 2009 knockout black colt Nat King Kohl RF. By our US National Top Ten Futurity Champion Stallion and US National Top Ten Hunter Pleasure ATR Select, Earl Grey++/. She is tall, flashy and an in your pocket kind of horse.. She has started her training and is handling everything in a very thoughtful relaxed manner. Sweepstakes Nominated. 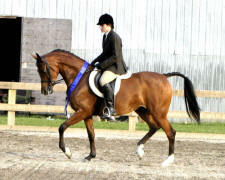 The X Factor RF (Xceptshahn x Simply The Best) - 2011 bay gelding. "Bolt" is an athlete! Tall, long legged, extremely handsome and very agile. This youngster will be competitive either in the show arena or as a distance horse. He is very intelligent and afraid of nothing. Sweepstakes nominated. 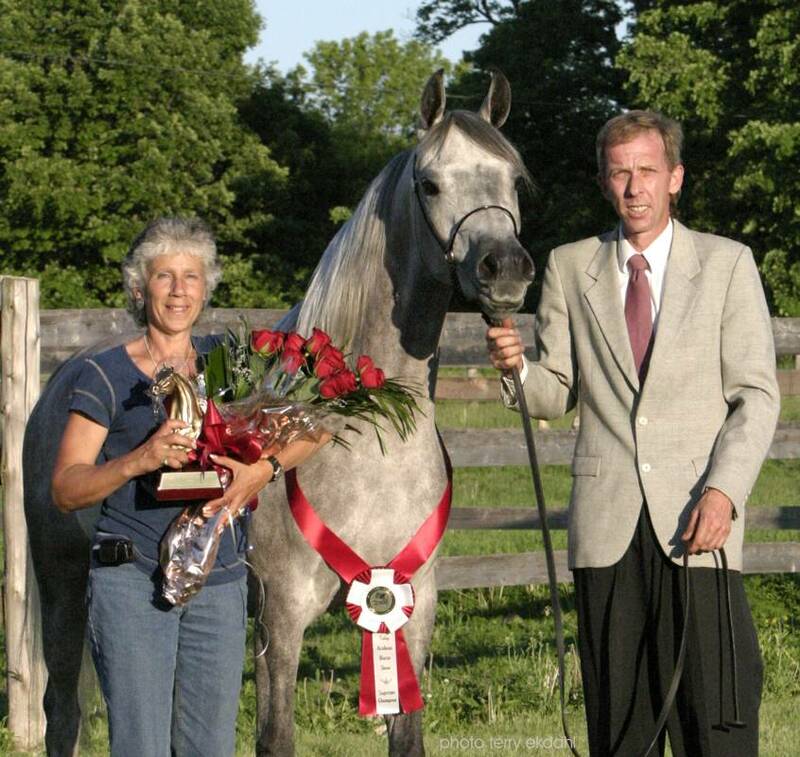 Front Row Center RF (Earl Grey++/ x MDA Kaladdinn) - 2008 Grey Purebred Arabian gelding. "Karter" will make a great show horse and best friend. He is a long legged, long necked beautiful youngster. He is quite a character, is inquisitive about all that goes on around him and has the same playful attitude as his sire. He exhibits the lovely easy gait that has made his sire, Earl Grey++/, such a successful Hunter horse. His dam is an undefeated Halter Champion who has been a great producer of Halter and Performance horses. Sweepstakes nominated. We're Drivin Ms Daisy (Promise Keeper x My Daisy Hawkins) - 2009 Purebred Chestnut American Saddlebred filly - mile long neck and a trot that is out of this world. 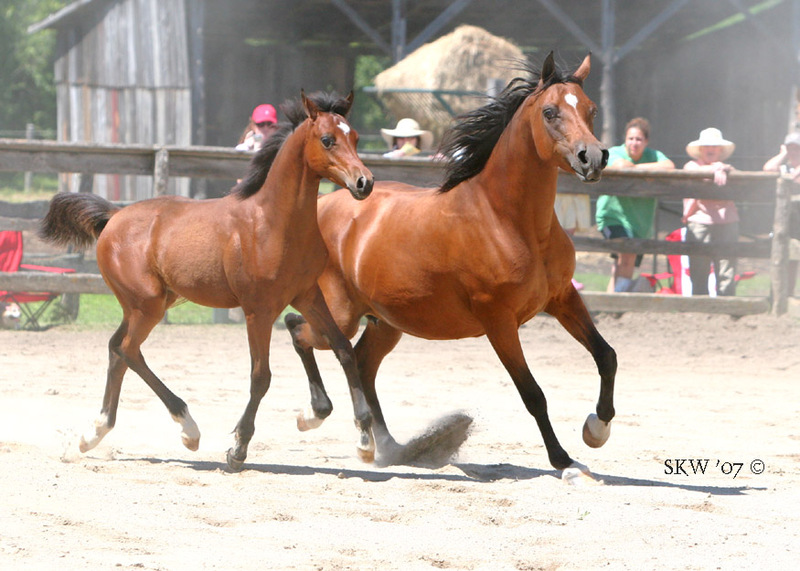 A full sibling to Five-gaited Stakes winner at Syracuse International and at Eastern States Exposition. This will be a top performance prospect. 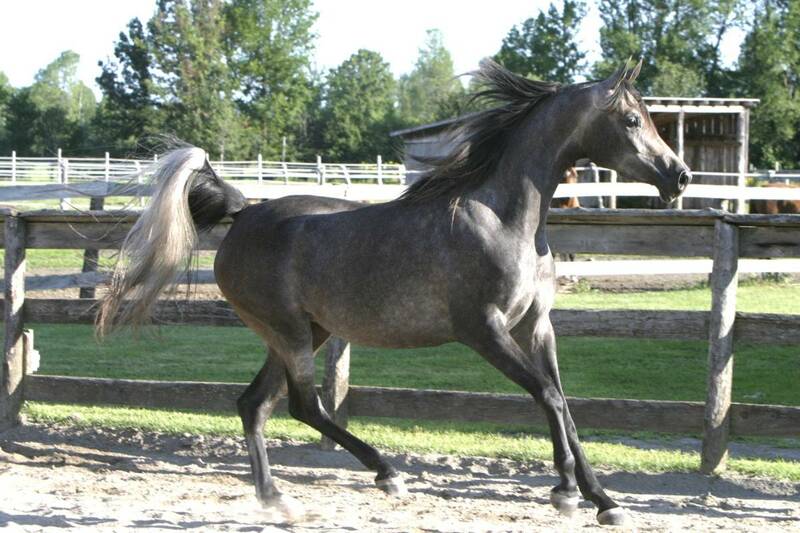 Nat King Kohl RF (Earl Grey++/ x Comin Up Roses) - 2009 Half Arabian gelding. 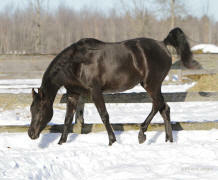 This tall, handsome black gelding is a full sibling to our very successful Peppermint Paddy RF+++/. "Kohl" should mature to 16 hh. He is a big, substantial horse with a long ground-covering stride. He should excell either as a Sport Horse or as a competitive trail/endurance horse. He has a great temperament, easy to get along with and loves people. Sweepstakes nominated. Romance in Rome RF (Pomerol x Alia Nazada) - 2009 Purebred Arabian filly. Dark chestnut, flaxen mane and tail. Rome is a tall, beautiful filly - great depth of body and very athletic. This filly has a wonderful attitude and is a beautiful mover. She has an incredible length and shape to her neck and will be an outstanding Halter horse as well as a Nationals level Hunter horse. Her dam is an Arabian Horse World Aristocrat. Her sire, a grand Straight Russian *Padron son. Sweepstakes nominated. SOLD - Congratulations to Russ Saunders, of Markdale, Ontario, Canada. 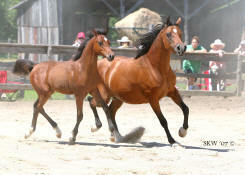 Vegas RF (Xceptshahn x MDA Kaladdinn) - 2006 Bay Purebred Arabian gelding, 16 hh. 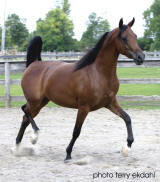 Long legged, long necked and a great mover - a top quality hunter pleasure or western prospect. Ground work started. Has an absolutely beautiful look to him. Sweepstakes nominated. SOLD - Congratulations to Jane Ferguson, Ontario, Canada. 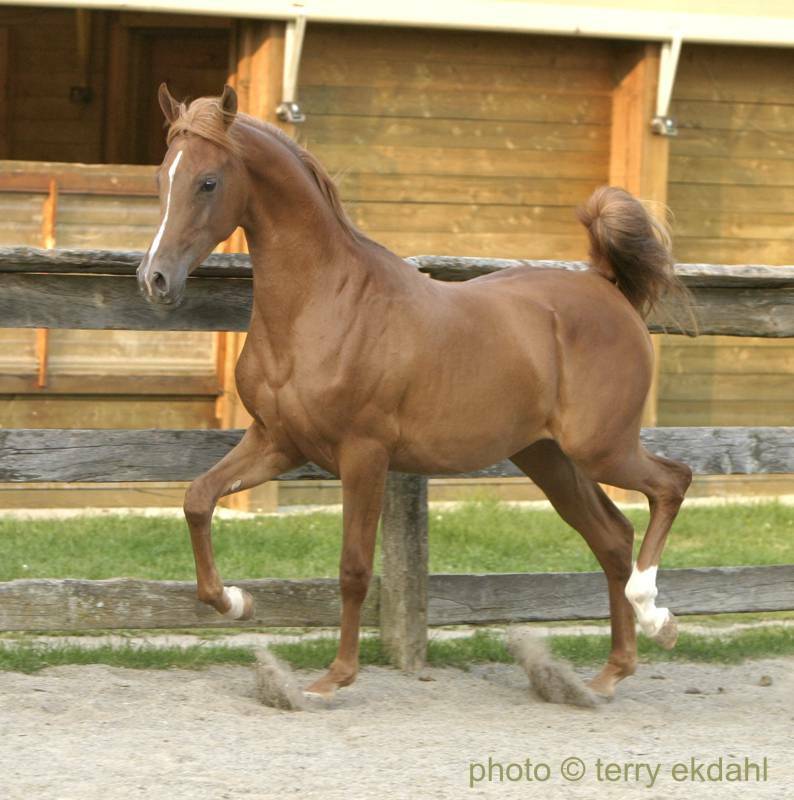 Love Letters RF (Baske Afire x Pretty Woman+) - 2006 Chestnut Purebred Arabian Filly. 2006 Chestnut Purebred Arabian filly - An extremely athletic youngster - will make a great driving horse and English style riding horse. This filly was a Regional Top Five Yearling Sweepstakes Champion (Region 18). She is correct, athletic and has a great temperament. 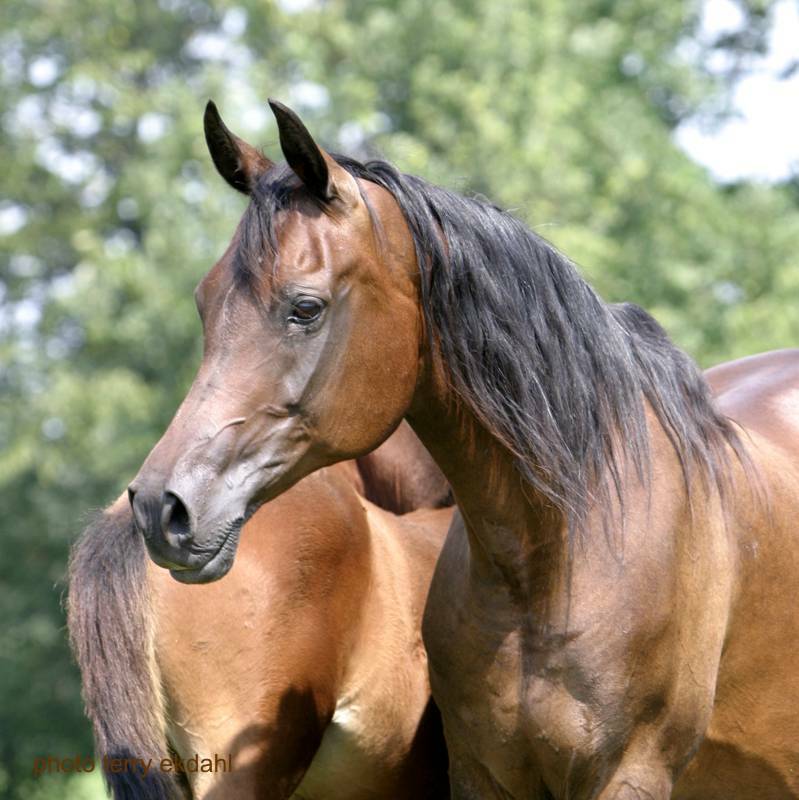 Her sire is a top producing Arabian Stallion who is himself by the breed's # 1 Sire, Afire Bey V. Her dam is the undefeated Halter Champion & winning Hunter Pleasure horse Pretty Woman+. Sweepstakes nominated. SOLD - Congratulations to Angie Alguire, Double A Arabians, Ontario, Canada. 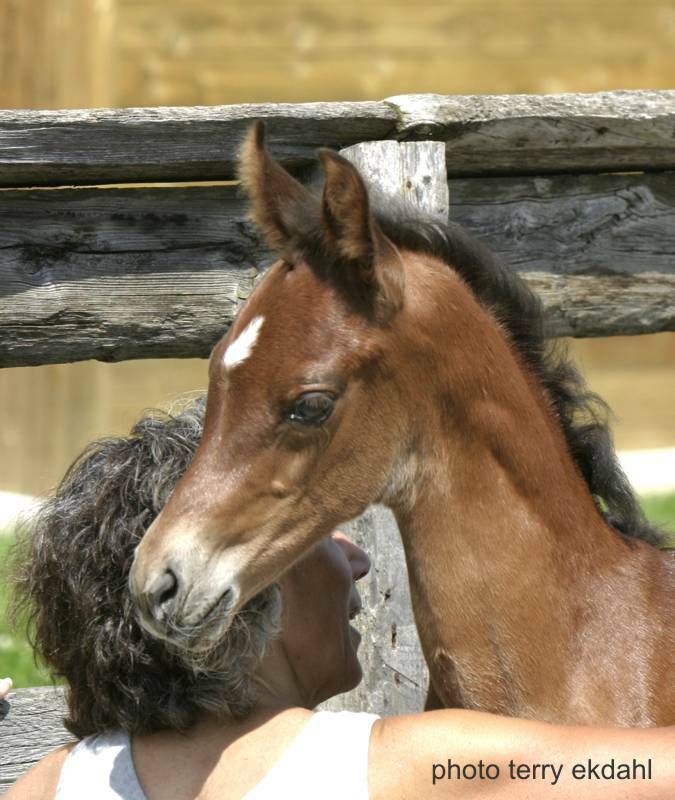 Paisley RF (Pomerol x Meddea KA) - 2008 Liver Chestnut Purebred Arabian Filly. A super flashy filly with a blonde mane and tail. She is a beautiful mover - trots beautiful both front and back and will wear a bridle very nicely. A sensible, loving filly - she will stand out wherever she goes. Sweepstakes nominated. Photo at left is of "Carley" as a weanling; photos below taken in 2009 as a yearling (...be sure to click on photos to enlarge...). SOLD - Congratulations to the Orlob's - Steve, Heidi and Daniel of Oakwood, Ontario. 2006 Bay Purebred Arabian Filly. 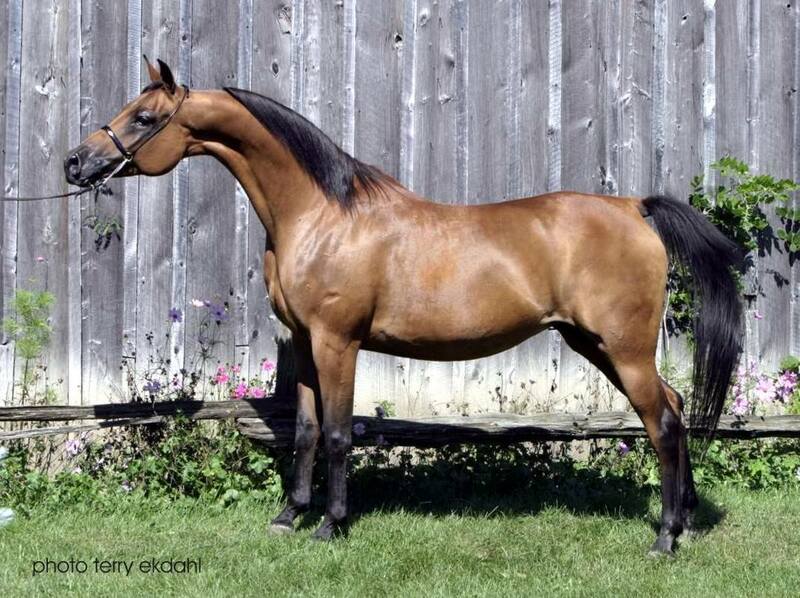 This beautiful going mare was Eastern Canadian Breeders Champion Yearling Filly and Breeders Futurity Champion Filly in 2007- She is a full sibling to many of Rideaufield’s top show horses - Pretty Woman+, Colorado RF, Liz Taylor RF, Xceptshahnelle Woman, etc. This filly is capable of being a very successful Halter and Hunter. Has a great temperament. See her video by going to this video link . . .
SOLD April, 2010 - Congratulations to the Orlob's - Steve, Heidi and Daniel of Oakwood, Ontario. 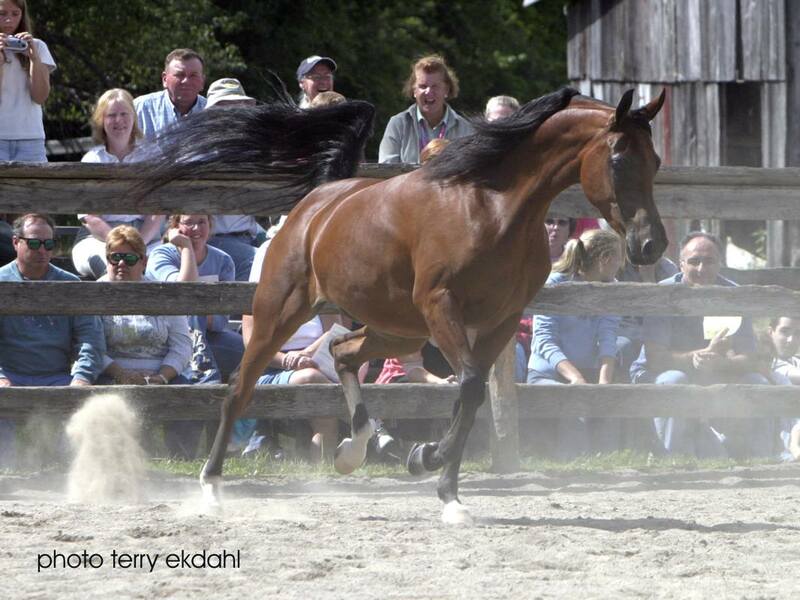 MDA Kaladdinn has been both a very successful show horse and brood mare. She is a Region 17 Champion Mare and is an undefeated Class A halter Champion. 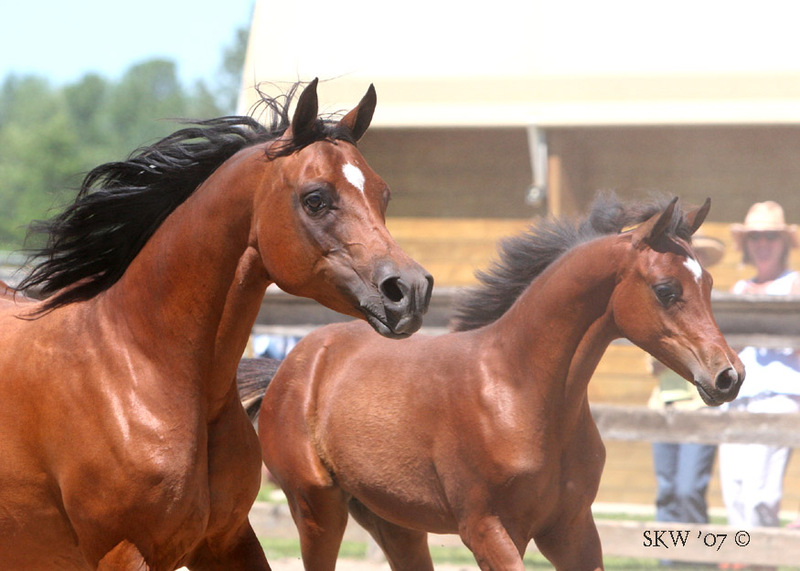 "Kelly" herself has produced two Regional Top Five Halter Mares. She is by an *Aladdinn son out of a Huckleberry Bey daughter. She is an extremely tall mare, very correct with an incredible long, fine, snakey neck. She consistently passes on her size and elegance to her babies. 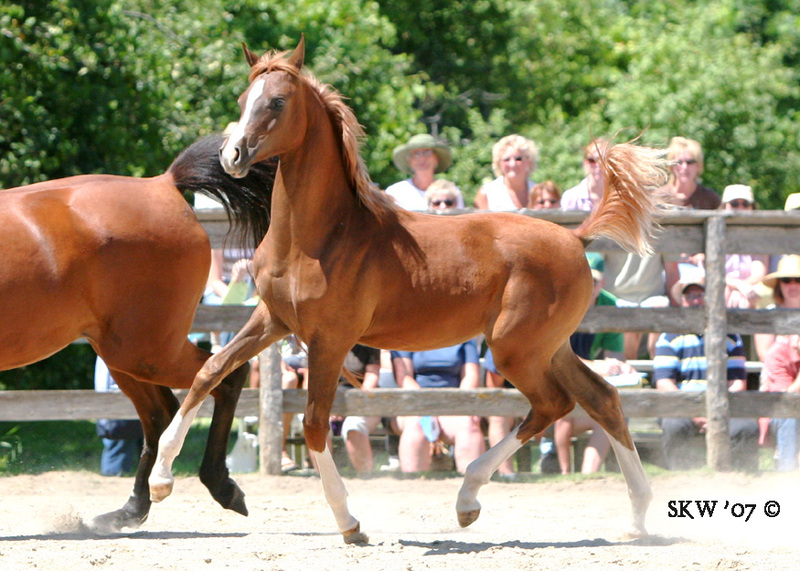 MDA Kaladdinn produced a tall, atheletic, long necked colt / now gelding (Vegas RF) in 2006 by our Bey Shah+ son, Xceptshahn. We were thrilled to welcome her 2008 baby, a beautiful grey colt (Front Row Center RF - "Karter" by his barn name) by Earl Grey++.... (see his video by going here ...) She is in foal to Earl Grey++ for 2010 (update: a beautiful grey filly!). 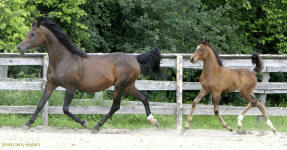 Because of her pedigree, accomplishments and success as a brood mare we had mixed feelings about offering her for sale. Nevertheless, while we are attempting to reduce our numbers and our level of involvement in the horses, we feel that her new owner now has a wonderful opportunity to have an exceptional brood mare. 2008 dark chestnut Purebred Arabian filly. This is a gorgeous youngster - tall, elegant and strong - will definitely make a top quality Hunter horse. This is a complete "people lover" and has a very inquisitive nature. Sweepstakes nominated. 1999 Bay Purebred Arabian Mare. From the time she entered the show ring as a yearling, Pretty Woman+ has rarely been defeated. Region 16 Champion both Open and AOTH. 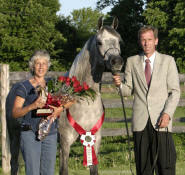 Multiple Halter Championships in Canada and US. 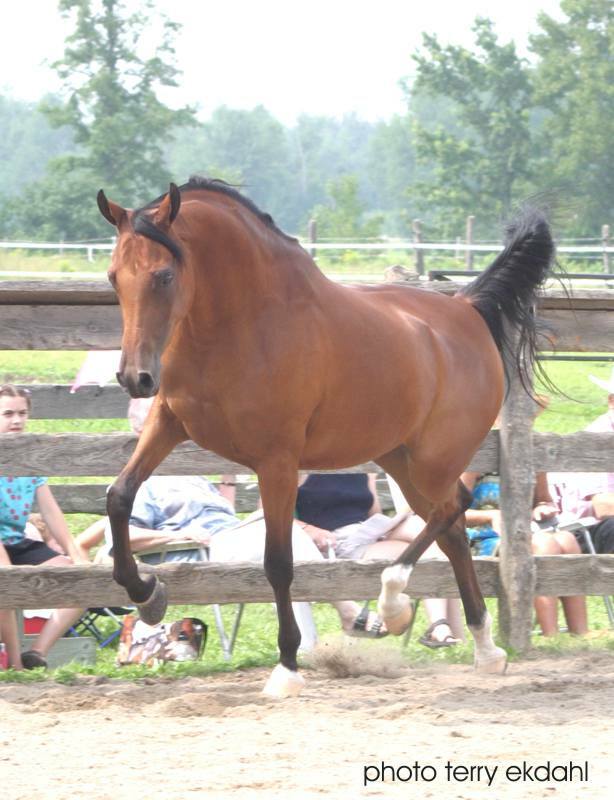 Three times Eastern Canadian Breeders Champion Mare. Region 18 Top Five Open Hunter & Eastern Canadian Breeders Reserve Champion Hunter. Dam of Top Five Sweepstakes Filly. 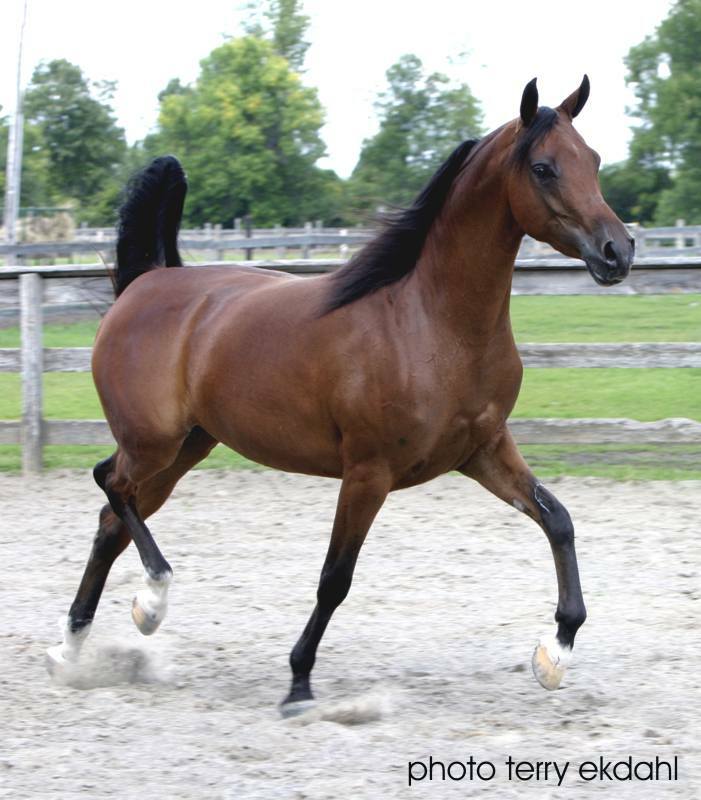 Sound and healthy - highly qualified as both a show horse and a brood mare. Sweepstakes nominated. SOLD - Congratulations to Lucy and Rob Knight of Chatham, Ontario on becoming the proud new "parents" of this beautiful and successful mare. Colorado RF+// (Xceptshahn x Alia Nazada) - 2004 Bay Purebred Arabian Gelding. Colorado is an absolutely gorgeous bay, 15.2 hh gelding who turns heads wherever he goes. His show record at halter speaks for itself. His career under saddle will be equally as promising. We feel he is a Nationals quality Hunter Pleasure horse. He is a full sibling to the multi Regional Champions Pretty Woman+, Xceptshahnelle Woman RF, Liz Taylor RF. His dam, Alia Nazada (*Ibn Safinaz x Alas Canadia), is an Arabian Horse World Aristocrat Mare. His sire, Xceptshahn, a recognized sire of halter and performance champions and many times a Top 30 Sweepstakes Sire. 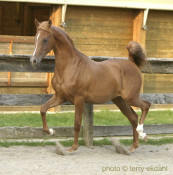 All Maid Up RF (Pomerol x Xceptshahnally Maid) - 2008 Chestnut Purebred Arabian Filly. This is one pretty filly. Overall quality and beautifully marked. "Juno" is a most interesting filly to watch. At such a young age she has an incredibly balanced lope and carriage and frame, which will undoubtedly enable her to be a top quality Western Pleasure horse - with the temperament to carry it off. Our farrier, a reining man himself, says she has what it takes to be an excellent reining horse. And, certainly, also a very competitive halter prospect. Sweepstakes nominated. SOLD - Congratulations to Marjolaine Bissonnette and Cathérine her daughter. See you at the shows! Ginger Rogers RF (Pomerol x FS Betty Grable) - 2008 liver chestnut Purebred Arabian filly with 4 whites and a lovely blaze. Big bodied striking filly who just speaks to be a top western prospect. Sweet as can be and the farm favourite of all visitors. Sweepstakes nominated. SOLD/VENDUE -Félicitations et merci à Jacinte et Michel Bouchard, Écurie Impulsion à Baie St-Paul, QC à l'achat de cette très jolie pouliche! 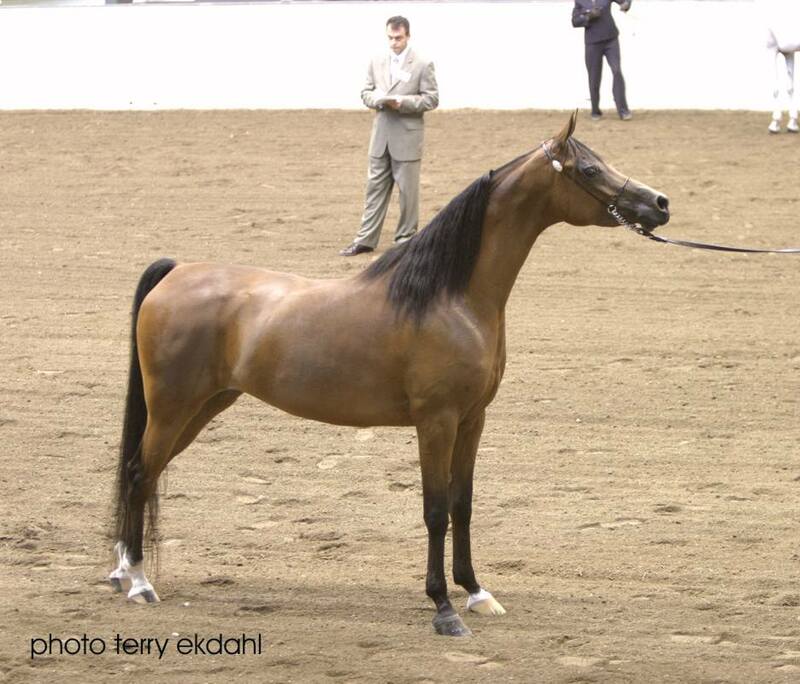 FS Betty Grable (Padron’s Psyche x KJ Kalayla) - 1994 Bay Mare, This is a lovely Psyche daughter. Huge eyes, long, long neck and a very smooth body. Betty has produced an exceptional colt by Earl Grey, an outstanding 2007 colt by Xceptshahn and an absolutely gorgeous filly by Pomerol in 2008. SOLD - Congratulations to Kelly and Kristen Bowman, of Burford, ON on this addition to their equine family. 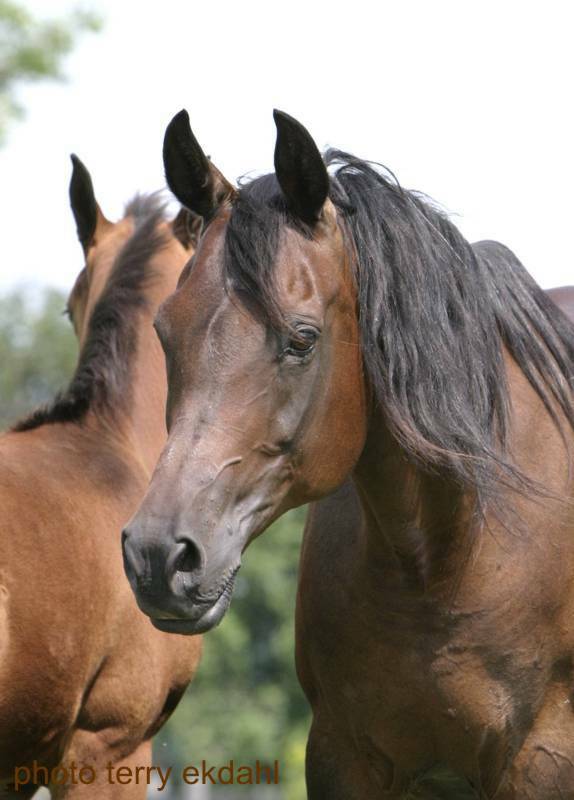 Meddea KA (*Ahmedd x Cometeanna) - 1987 Black Bay Purebred Arabian Mare. Tall, extremely well bred, beautiful mare. Has been a Champion as a youngster - has produced a Regional Top Five Purebred Mare and a Top Ten Half Arab Sport Horse Mare. Meddea herself is a Sweepstakes nominated mare . 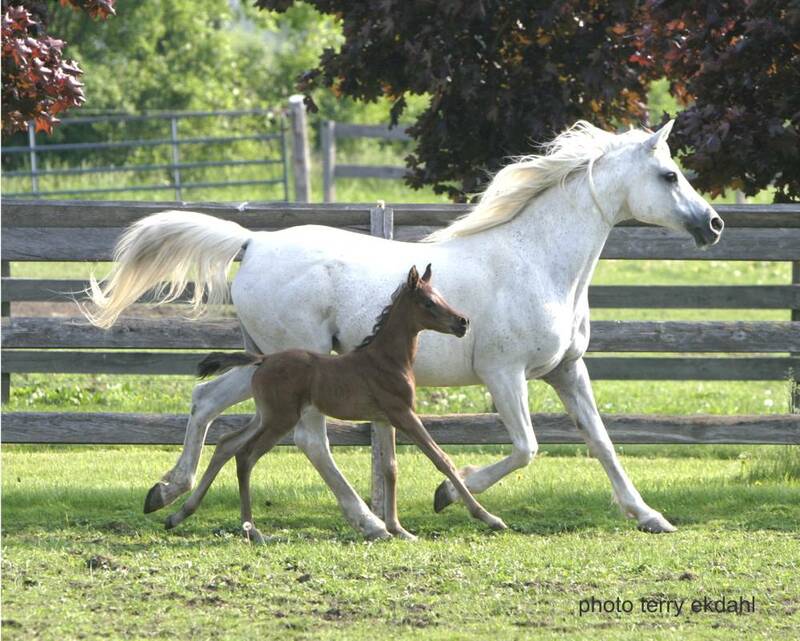 ◄ Meddea shown (left) with her outstanding 2006 Earl Grey colt, Zane Grey RF. SOLD - Congratulations to Danielle Gregory on her acquisition of this lovely mare. 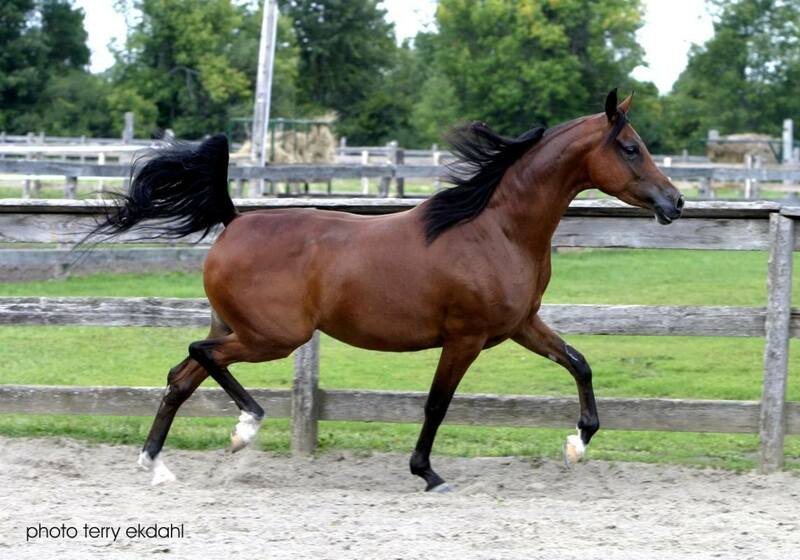 Born to Boogie (The Royal Heir x Autumn Dusk) - 2001 Bay Half Arabian Gelding. A great moving horse who will win both under saddle and at halter. 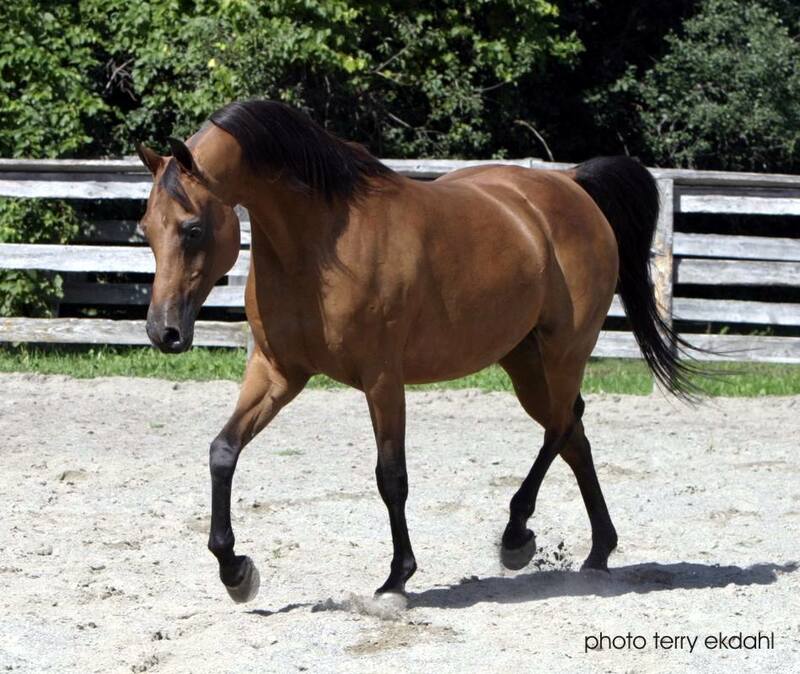 This half Arab gelding is not only very handsome but also has a great personality. He has started well under saddle and is going to make a very competitive Hunter Pleasure gelding. 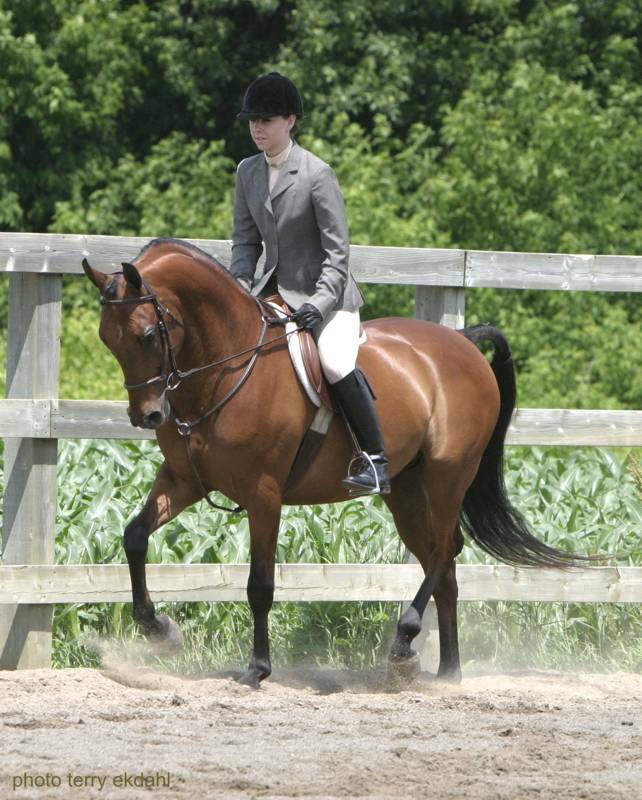 He also has been ridden on the trails and has the athletic ability and temperament to make a topnotch CTR horse. Here is a horse who will be able to win in the show ring or out on the trails - and he is sweet! What more could one ask for? SOLD - Congratulations to Ellen McLean of Richmond, Ontario on her purchase of "Prince". This gorgeous young mare started her career under saddle with a bang. Quality. Talent. And a wonderful work ethic. SOLD - Congratulations to Dan and Merrilee Lyons. 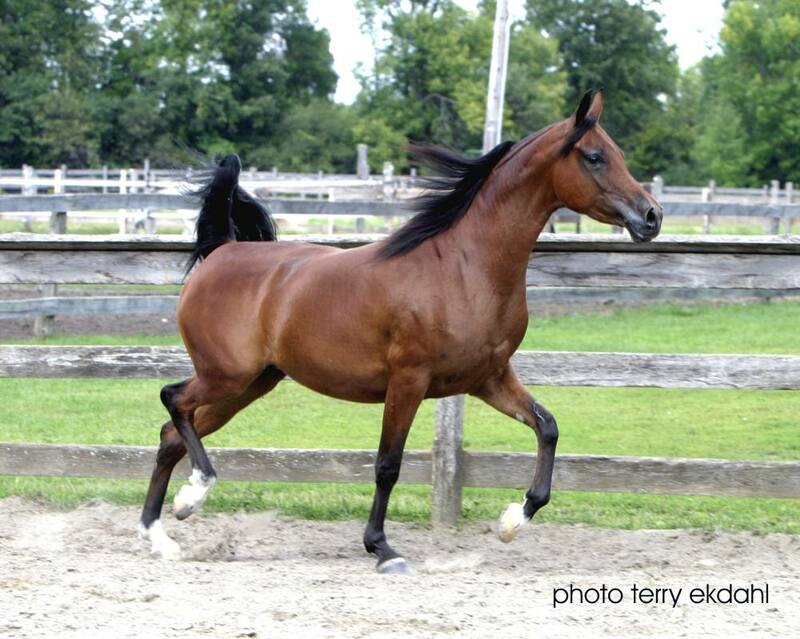 "Enya" will start her show career with her new owners under the guidance of Cathy Vincent, Adandy Farms, Delaware. This beautiful Amurath Baikal daughter has been started under saddle. Her easy gait and obvious athleticism suggest as successful a performance career as her halter career. With her pedigree she will have tremendous value in the future as a brood mare. Xceptshahnelle Woman RF (Xceptshahn (x Bey Shah+) x Alia Nazada (x *Ibn Safinaz)) 2003 Grey Purebred Arabian Mare. 2005 Region 16 Unanimous Champion Two-Year-Old Sweepstakes Filly, Region 16 Top Five Mare, Grand Champion Mare, Springfield, Mass. This 15.2 hh steel grey mare is maturing beautifully. 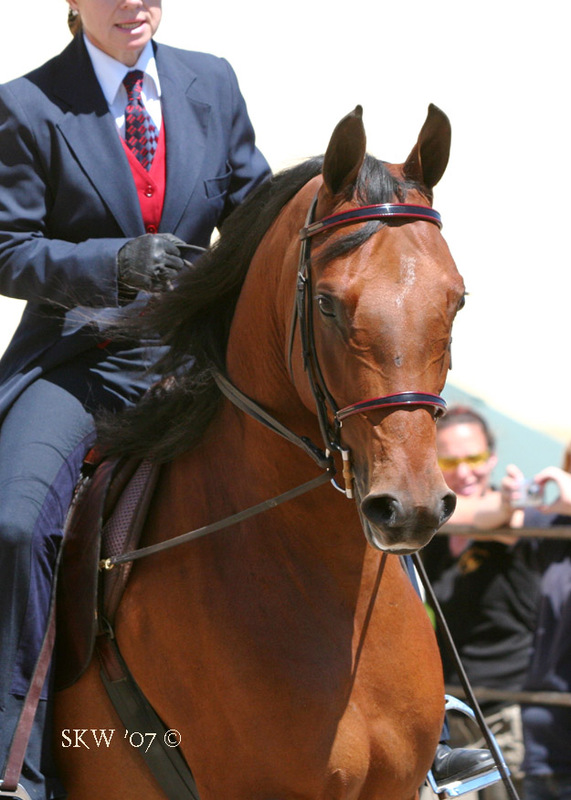 A most elegant look, a beautiful shapely neck and an imposing presence under saddle. "Skye" has had four months work under saddle and will be a standout in the Hunter ring. She will also be a star amateur and open halter mare. A full sibling to Pretty Woman+, multi Regional and Breeders Champion at Halter as well Breeders Reserve Champion and Regional Top Five Open Hunter Pleasure Champion, this mare promises to be equally successful. Sweepstakes nominated. SOLD - Congratulations to Jennifer Delia of Winchester, ON on her purchase of "Skye". Maid of Honour RF (Pomerol x Xceptshahnally Maid) - 2007 Chestnut Purebred Arabian Filly. One could not ask for a prettier filly - liver chestnut, 4 white socks, a beautiful face marking - and a flaxen mane and tail. 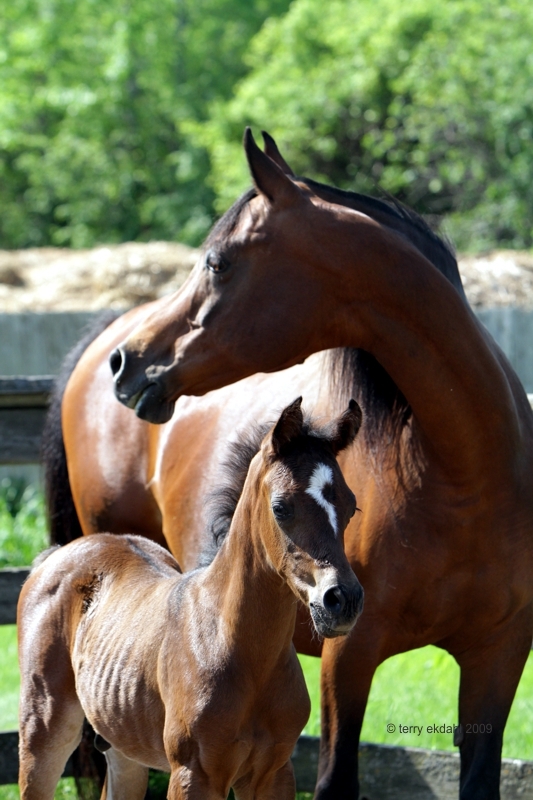 This tall beautiful Pomerol filly is a knock out - sure to be noticed wherever she goes. Beautiful conformation, lovely mover, and a great personality. These Pomerol babies are quite something. This filly is out of an Xceptshahn daughter who is out of a double Three-B-Rasheik++ daughter. Sweepstakes nominated. SOLD - Congratulations to Gerry and Lorraine Nadeau of High River, AB on this outstanding Pomerol filly. 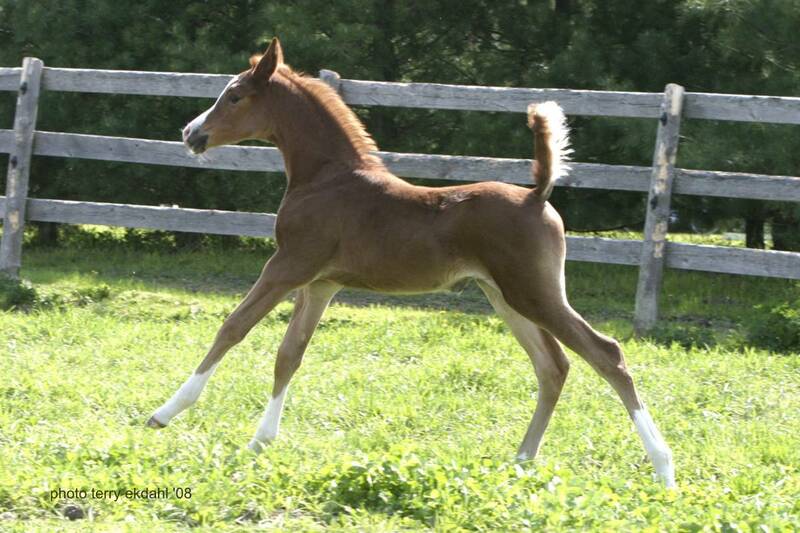 Easy Rider RF (Xceptshahn x FS Betty Grable) - 2007 Bay Purebred Arabian Colt. 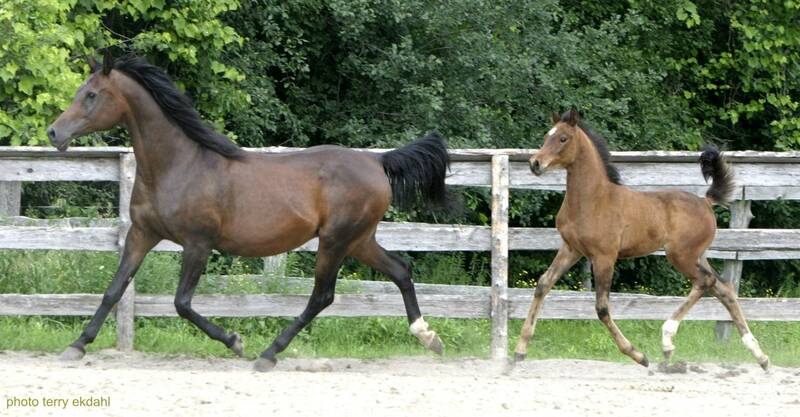 The next Xceptshahn star in the making - you have seen these horses win both in halter and under saddle. This colt will be no exception. A tall, bay youngster. Very correct, beautiful bodied and a gorgeous face. Plus, "Harley" has the attitude it takes to make him a top show ring contender. His dam is a beautiful Padron’s Psyche daughter. Sweepstakes nominated. SOLD - Congratulations to Alton Price of Richmond, Quebec on his purchases of "Harley". Ice Capades RF (Earl Grey++/ x Comin Up Roses) - 2006 Bay Half Arabian Filly. Another future champion - but this one in the half Arab division. “Ice” is a full sister to the much honoured Peppermint Paddy RF+++/. Comin Up Roses, her dam, has produced multi National Top Ten Halter and Performance Champions. “Ice” is a tall bay long necked filly. She is very correct and definitely a quality show filly. Sweepstakes nominated. SOLD - Congratulations to Russlyn Patriquin-Dyke of Carrolls Corners, NS. 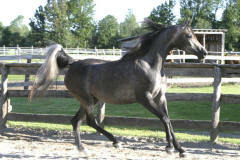 Shades of Grey RF (Earl Grey++/ x EAI Tahawa) 2006 Grey Purebred Filly. This has been a very successful cross for Rideaufield Farms. This filly has the nicest temperament one could wish for. She is very correct, has a high set on long shapely neck and like all her siblings - just a quality filly. Sweepstakes nominated. 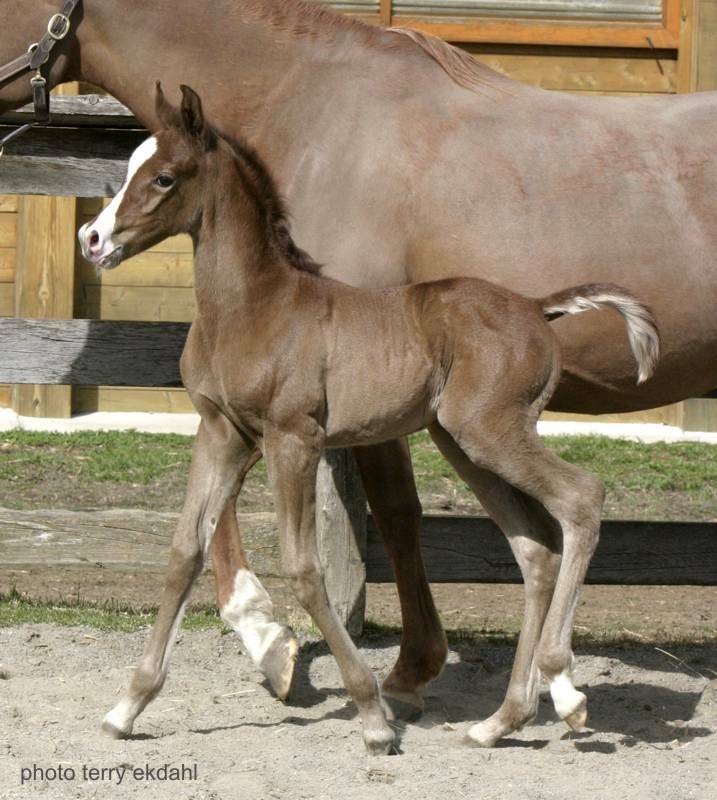 Patricia RF (Earl Grey++/ x Alas Canadia) - Bay Filly. Foaled May 24, 2006. This black bay filly is the sweetheart of the farm. She is very pretty and correct, has enormous soft eyes. She always has her tail over her back and loves to show off. A beautiful pedigree - a beautiful filly. Sweepstakes nominated. Last Updated on Saturday February 08, 2014.